From January 24-27, Phiren Amenca organized our annual Regional Volunteer Seminar in Budapest, Hungary. 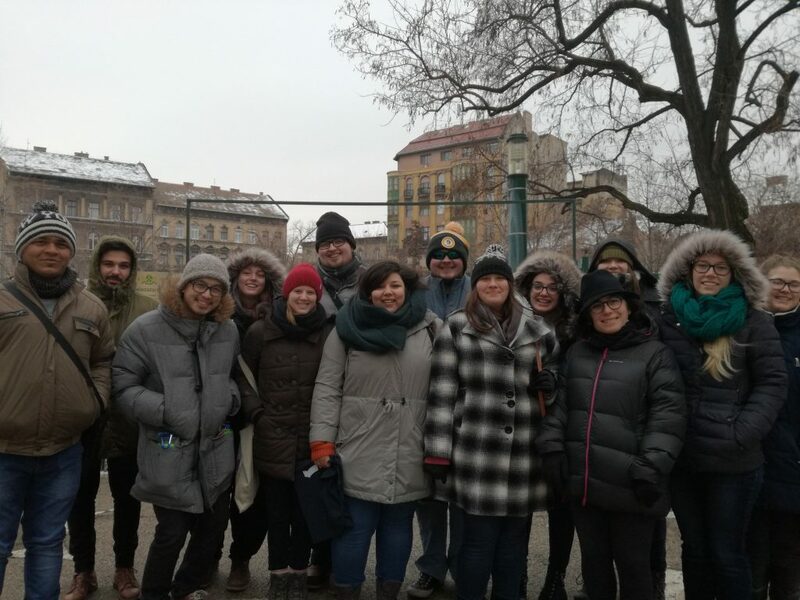 Thirteen volunteers serving in placement sites across Hungary and Serbia gathered together in the 8th District for a four-day conference on recognizing and combating antigypsyism in their communities. Ten participants were from the Young Adults in Global Mission program of the Evangelical Lutheran Church of America, and three were Erasmus+ volunteers from India, Italy and Turkey. On the first night of the seminar, participants were able to attend the performance of the Roma band Parno Graszt. Music is stereotypically considered to be one of the beloved occupations of Roma communities, and we enjoyed the fusion of authentic Romani music and world music together with a mixed audience. 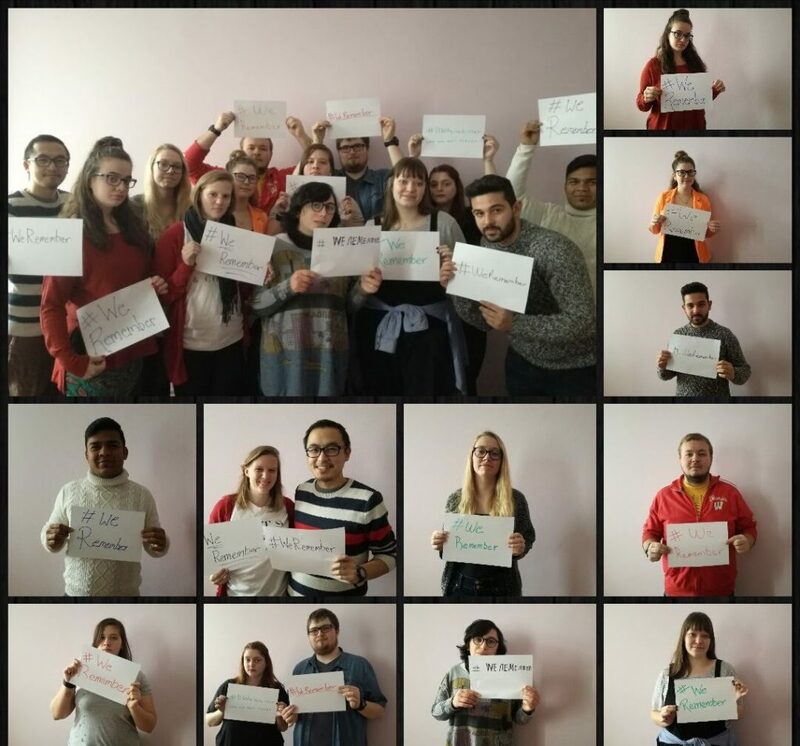 During the four days of the seminar, we discussed the ongoing stigmatization of Roma people in society using games, non-formal educational tools and experience sharing. We also disseminated information regarding the historical treatment of the Roma in Europe, through Holocaust memoirs, film clips and a walking tour through the neighborhood of Józsefváros. Referred to as the ‘Gypsy district,’ Józsefváros is widely considered a ‘dangerous neighborhood’ because of the ethnic diversity of its population. With the help of our Uccu Foundation tour guide Bettina, we came to understand the diverse and beautiful history of the neighborhood and the people who live there. At the end of the conference, we participated in the social media campaign created by the World Jewish Congress for International Holocaust Remembrance Day using the hashtag #WeRemember. The issue of Holocaust denial is an important one for volunteers serving in Europe – some 30% of Europeans report they know little or nothing about the Holocaust, which means a third of Europeans are not aware of the long European history of antisemitism and antigypsyism. That same day, our volunteers were able to analyse situations where they experienced or witnessed discrimination in their placement sites. We processed those experiences by identifying stakeholders, the flow of power and opportunities of intervention. In an activity based on the methods of forum theater, volunteers experimented with solutions in a safe environment. Our participants told us they learned a lot about the situation of Roma people in Europe and felt renewed and energized to return back to their service. “This conference added a whole new layer of understanding to what I’ve been learning about Roma people and antigypsyism,” said John Baynton, who volunteers in Novi Sad, Serbia. The thirteen volunteers returned back to their sites this week, equipped with some new tools and a deeper understanding of the way racism manifests in their communities.